Online sports betting is growing in popularity in Mexico. Finding a reputable sportsbook though can be challenging. Who should you trust? Which sites are legitimate? 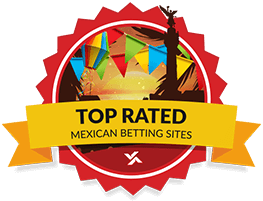 We’ve compiled a list of the top 10 Mexican betting sites based on our tests, trials, and research. Just click the “Read Review” button next to each sportsbook to learn all the details of that particular site for more information. We’ve also put together other important information as a guide to online betting for Mexican sports bettors like tax considerations, the available deposit/withdrawal options, and more. One of your hockey buddies probably uses Bodog. They've been dominant on the scene for a while now and with good reason. bet365 serves millions of bettors around the world - the sheer number of international leagues they cover is unparalleled, among other perks. Betway makes it easy to get started and then keeps you there with its huge selection and numerous ways to bet. 888sport is a fun site that makes it easy for the beginner to get started. It also offers enough extras to keep seasoned bettors interested, though some pro-bettors may be turned off. A big name that's been in business since 1934 doesn't need flashy promos as long as the service is dialed-in - William Hill is that name. WagerWeb sportsbook has a reliable history and a very generous rewards and bonus program, making it one of our go-to sites. 5 Dimes is the Yankees of sportsbooks - they're safe, established, and offer a premium product - but they also have exciting promotions reminiscent of minor league ballparks! It's the best of both worlds. Is the sports betting industry regulated in Mexico? Yes, but the online industry is very under-regulated. Are online sportsbooks required to have a license in Mexico? In theory, probably; in practice, no. Is it safe to use unlicensed sportsbooks? It depends on the site. Some sportsbooks that aren’t licensed in the country are safe, while others are not. Yes. Sports betting, generally, is legal in Mexico. In theory, the industry is wholly regulated and subject to a licensing system. In practice, however, that’s not how things plays out online. Most of the applicable laws do not specifically account for online sports betting because they were drafted before the internet was a common sports-betting medium. Reading the applicable legislation logically, it would have accounted for online betting if the internet were around at the time. As such, the laws ought to be interpreted as covering online betting. But the fact of the matter is that Mexico lacks a coherent online licensing system, and the end result is that the online betting market in Mexico is dominated by foreign-based sites, many of which do not hold licenses. The Ministry of Internal Affairs has the authority to regulate the industry, according to Cesar Morales Galan of Deloitte Mexico, but it has not taken a terribly proactive approach to doing so. Under the current laws, unlicensed offshore sportsbooks are not legally allowed to offer their services to Mexicans, but it’s clear that Mexican residents are free to play at foreign sportsbooks, whether they are licensed or not. And the lack of a robust regulatory system has resulted in many unlicensed options being available in Mexico. Efforts were made to revamp the country’s gaming laws in 2017 in order to bring “necessary federal oversight” to the online betting and gaming industry, but those efforts fell through, which means the status quo will prevail for the time being. What Are the Pros and Cons of the Current Legal Regime? The status quo is both good and bad for Mexican bettors. That leads to sportsbooks competing with each other for customers which, in turn, leads to lower juice, better bonuses, and all the other perks that free markets bring to the consumer. On the down side, many of the sportsbook options available to Mexicans are of dubious quality because no one is regulating entry into the marketplace. Charlatans are free to set up shop next to honest merchants and, from the outside, it can be difficult to tell them apart. Don’t let that completely scare you off, though, because unbiased sportsbook reviews can help out on that front. Do Mexican Bettors Have to Pay Tax on Their Winnings? If it’s income, yes. Mexico has a 29% income tax rate, regardless of how that income is generated. Otherwise, taxes are handled at the state level. What Are the Common Deposit and Withdrawal Methods at Mexican Sportsbooks? The most common withdrawal and deposit methods in Mexico largely mirror those available in the United States and Europe. Visa, MasterCard, and American Express are widely accepted by Mexican sportsbooks, and bank transfers are also popular, especially for withdrawals. Most sites still have the option to deposit and withdraw by good old fashioned check, as well, though this obviously comes with longer wait times. Depending on the site, e-wallets like Neteller may also be available. These can cut down on delays, but if speed is your primary concern, then virtual currencies may be your best option. As in most countries, the use of BitCoin is becoming more prominent among Mexican sites due to its quick processing speed, its low fees, its lack of a middleman, and the anonymity it provides. In order to attract Mexican customers, some of the higher quality sportsbooks will keep account balances in Mexican pesos, while others will convert pesos to US dollars. What Are the Most Popular Sports to Bet on in Mexico? If you’ve ever set foot in the country, you know its fervent, undying love for European football/soccer. During the 2018 World Cup, even the sportsbooks in Las Vegas had to drastically reduce their odds on the Mexican national team because they were taking so many bets from ex-pats backing El Tri. Liga MX, the top domestic league, is the most popular sub-option within Mexican football betting market. But there is also no shortage of action on the major European leagues, the MLS, and of course, international play. Baseball is also hugely popular in certain regions of the country, even more popular than soccer in Sonora, Sinaloa, and a few other areas. The country has produced numerous MLB stars, and active players like Victor Arano, Julia Urias, Adrian Gonzalez, and Roberto Osuna keep the Mexican betting public interested in MLB action. Basketball isn’t quite as popular as baseball – and only four Mexicans have ever played in the NBA – but it’s a solid tertiary betting market in the country. One league that is gaining popularity among Mexican bettors is the NFL. The NFL has made a decided push to attract Mexican fans, playing a game in Mexico City in each of the last three years, and its efforts seem to be paying off. Futbol americano has become the fourth-most popular team sport in the country and a ubiquitous option at all Mexican sportsbooks.